I get a thrill out of little discoveries – such as this finding out that Holy Smithereens has been listed as one of 2014’s Best Luxury Travel Blogs by The Luxe Insider 🙂 I love the variation of other blogs listed as it’s important to know that within the luxury niche , there are still targeted areas that we write about, not to mention different styles of writing. 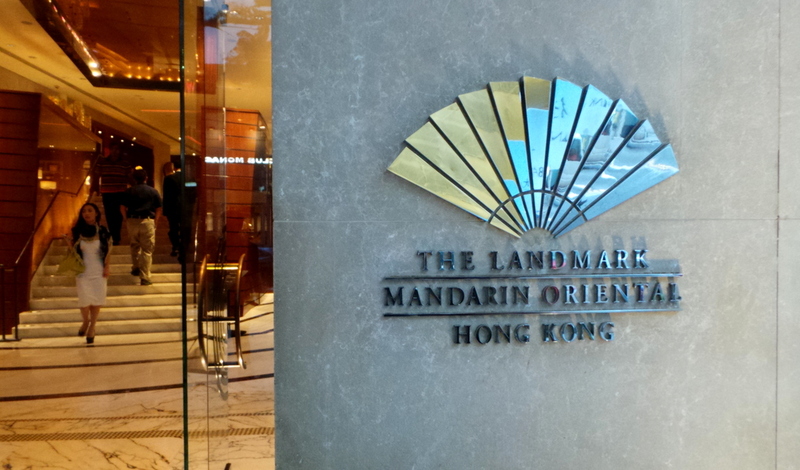 Another recent discovery that gives me a kick – The Mandarin Oriental brand. I’ve just recently experienced the brand and The Landmark Mandarin Oriental in Hong Kong has made it a very positive first encounter. 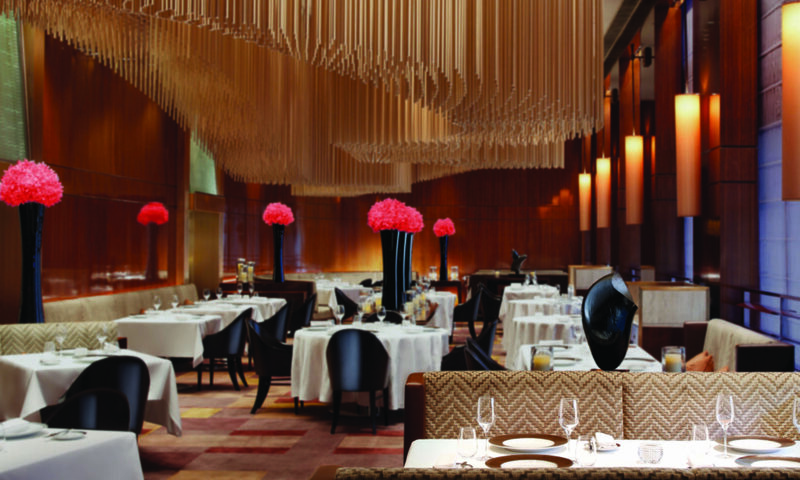 Having just reached it’s 9th year, The Landmark Mandarin Oriental in Hong Kong is one of the newer luxury hotels in the city. And coming from the same chain as the Mandarin Oriental, The Landmark M.O (Mandarin Oriental) is like the trendier, chicer version of it’s parent company. 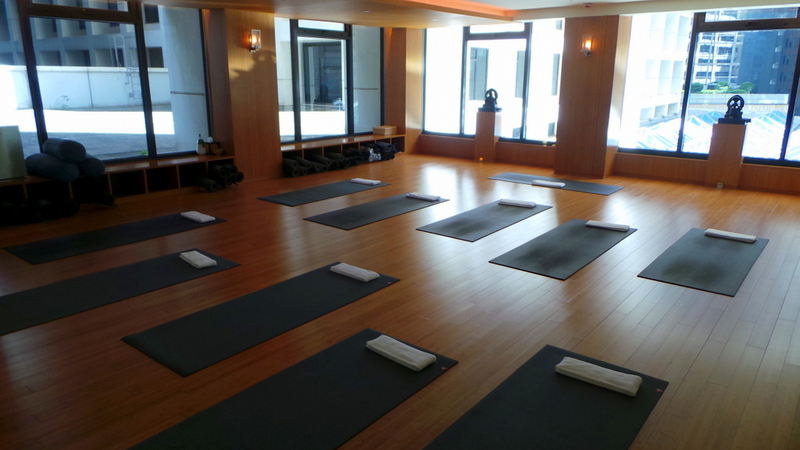 I was quite excited to stay at The Landmark Mandarin Oriental because I knew that this hotel was one that puts wellness and spa as it’s premium point, which is exactly my cup of tea. And when I received a message from the hotel the day before we flew to Hong Kong saying that they have prepared a spa treatment for us specifically to ease jet lag — I knew they were really serious about guests’ wellness! As a matter of fact, I was quite surprised to see this gentleman waiting for us as soon as we got out of the plane. He escorted us all through immigration and baggage carousel, and as we chose to take the train from airport to the city, he also showed us where to get board the train. The train was really convenient and fast – it took 20 minutes with just 4 stops. The airport line train is also fitted with baggage compartment sections so it was really easy. 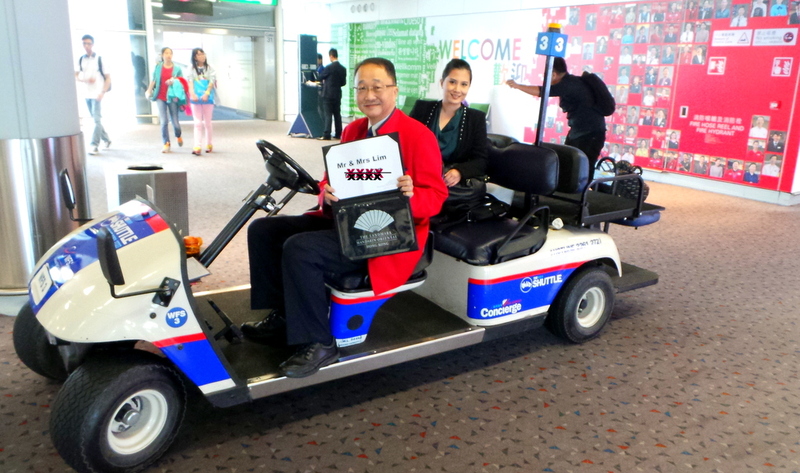 Less stress and hassle than getting a cab (which we did from Hong Kong station to the hotel). 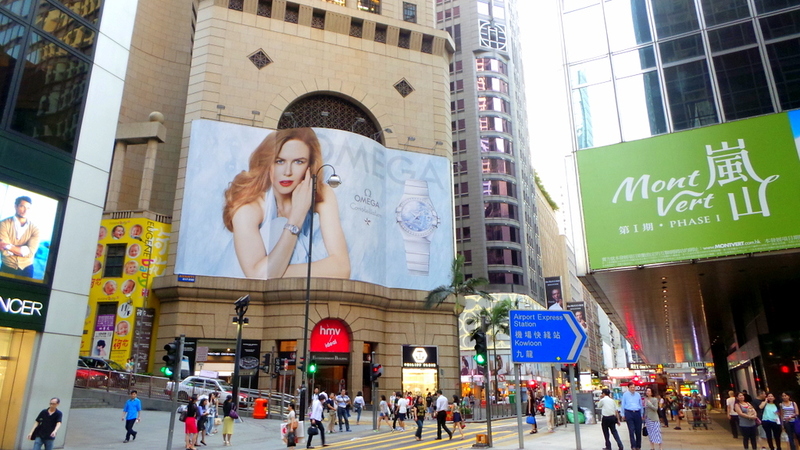 Located in busy Central district. The train station is just below the hotel (The Landmark mall, where the hotel is at, is connected to the station). Central district is quite busy, with lots of businesses, restaurants and shopping. You wouldn’t know that amidst this bustling area, therein lies the Landmark M.O, a quiet haven that will cocoon you from the “chaos” outside. The Landmark Mandarin Oriental has a very discreet kind of luxury which reminded me so much of this 5-star hotel in Paris. Located in a busy street (at The Landmark shopping mall no less), you won’t find any overly grand decor or blatant chandeliers/ grand lobbies screaming of “luxury” at this hotel. 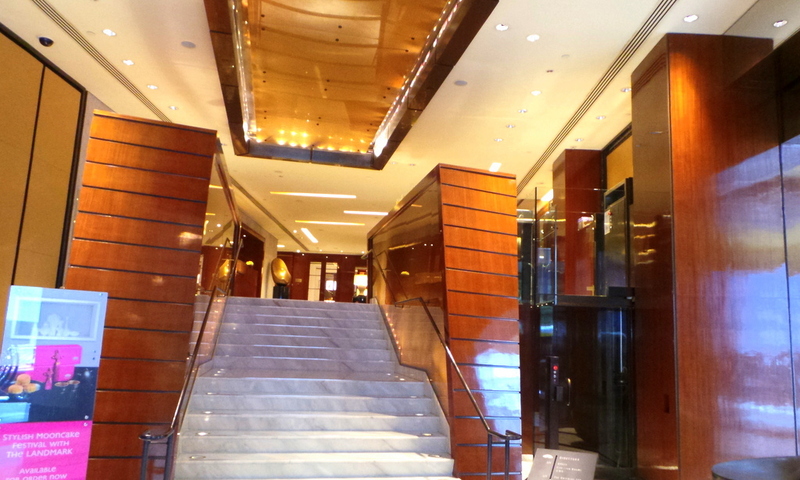 The entrance is quiet, and the first thing that hit me was the signature scent of the hotel. In the next days to come, whenever we walked the busy surrounds of the hotel and upon heading back, I would get a whiff of that musky scent, it would fill me with comfort and relief knowing we are “home”. Our check-in was brief and we were escorted to our room. The staff was well aware we had an appointment at the spa, and we arrived later than expected so off we headed to The Oriental Spa right away. 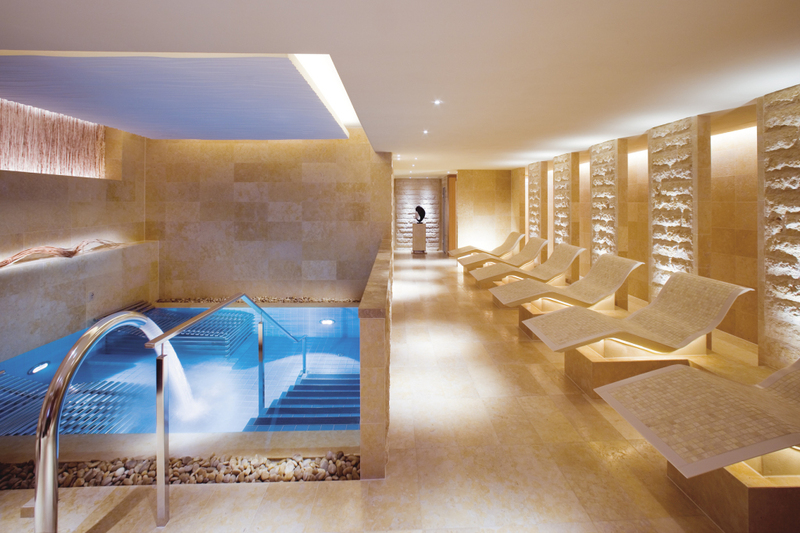 With just 113 rooms including 12 suites, The Landmark Mandarin Oriental has 2 full levels just for the spa, gym and pool. So imagine the proportion of all these amenities to the guests – you can be sure there will be no queues at the gym or have troubles booking the spa or using the pool. Zombie and I each received (in separate rooms), a 60 minute massage specifically created to help combat jet lag or stress and discomfort from travelling. There’s a separate heat and water facility for men and women. 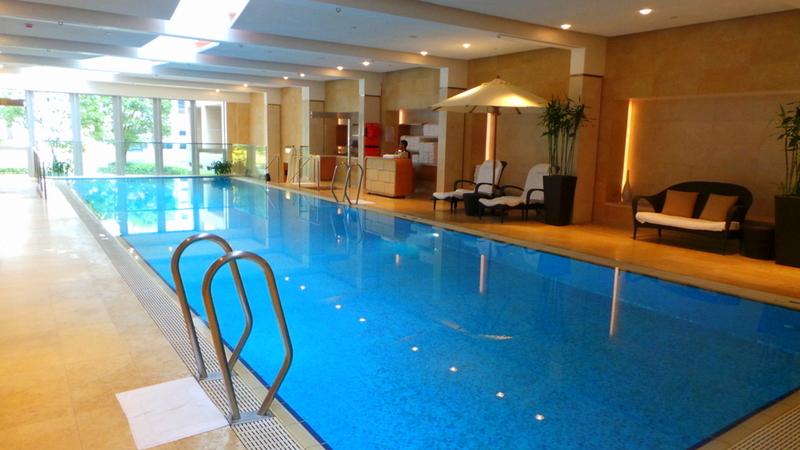 The heated pool looked very tempting but as I didn’t bring swimwear, I relaxed in the waiting area after changing into a fluffy robe. 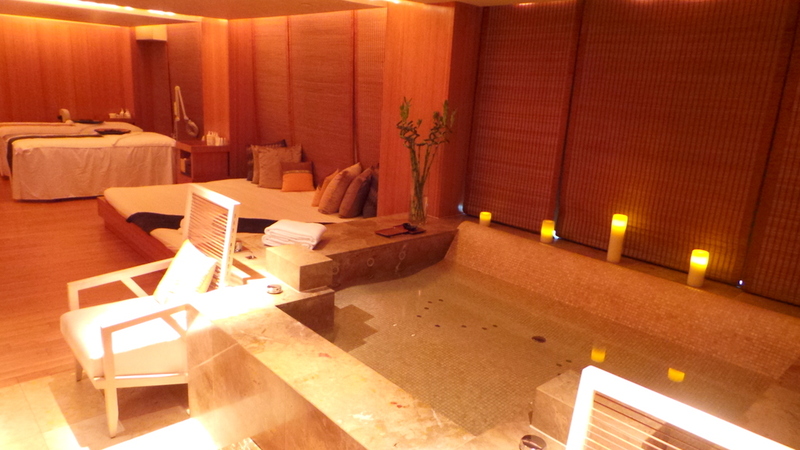 It was clear that The Landmark Mandarin Oriental is a pretty popular choice of day spa for locals. And they have reason to come to The Oriental Spa, because I spent the next 60 minutes receiving one of the best massage treatments I’ve ever had. My therapist explained that she will be using Sodashi products throughout the massage. Sodashi is a chemical-free Australian brand which caters to high end hotels and spas ( This brand is not for purchase outside the hotels/spas). Prior to the treatment, I filled out a form where I can specify my preference – from massage pressure to medical conditions, etc. And my therapist knew exactly what to do. I didn’t have to repeat anything (or even tell her to change the massage pressure). She even gave me advice how to better treat my injured ankle. 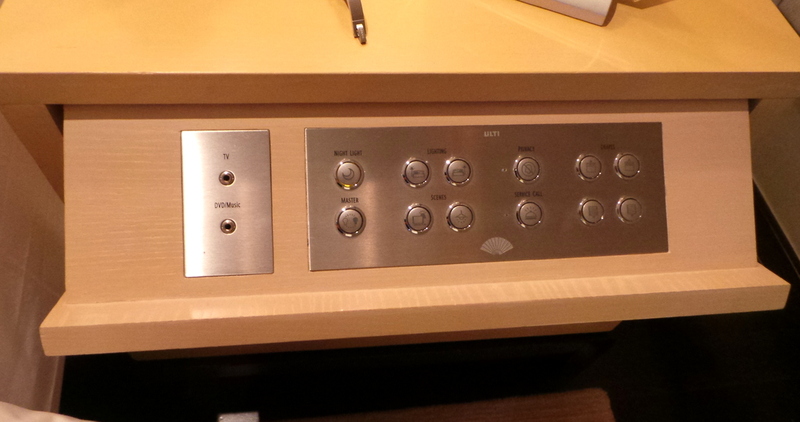 To my delight, the massage bed was heated. I fell asleep 10 minutes into the massage (that’s how good it was) and was gently woken up. I noticed that I didn’t feel cold at all , which was rather unusual because I normally feel cold after I receive a massage. And it turned out that throughout the 60 minute treatment, my therapist had been adjusting the room temperature and massage bed temperature as she is aware that when people relax, their body temperature drops and this is what usually made me feel cold. And while I slept through majority of the massage, it left me feeling more invigorated, and not feeling sleepy at all, not like other treatments I’ve had. 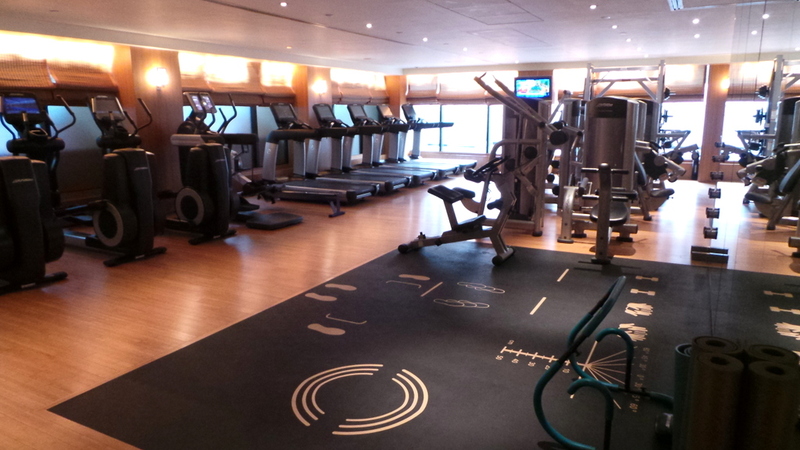 There’s also a room for Pilates class (with equipment) and an indoor pool. 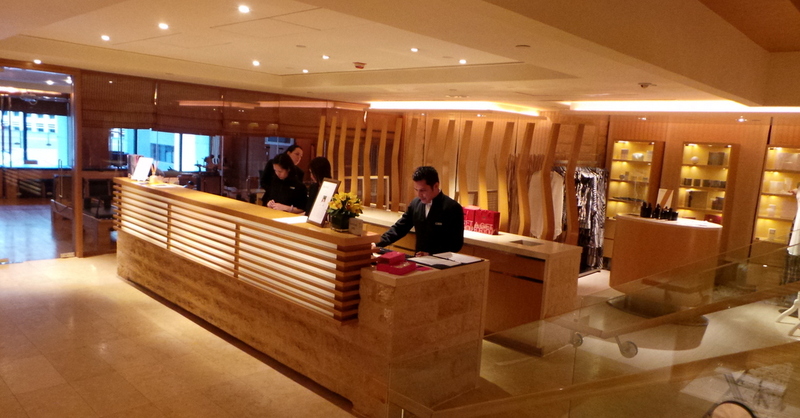 Now I know this is an unusual format of hotel review where I’ve showcased the spa first before the rooms. Just as The Landmark M.O has an impressive spa and wellness program and amenities, you can rest assured that the rooms are not lacking in the wow factor at all. The L600 Premier has a beautifully unusual layout wherein the centre of the room is the bathroom. And for someone who is obsessed with luxury hotel bathrooms, I was in hotel bathroom heaven. 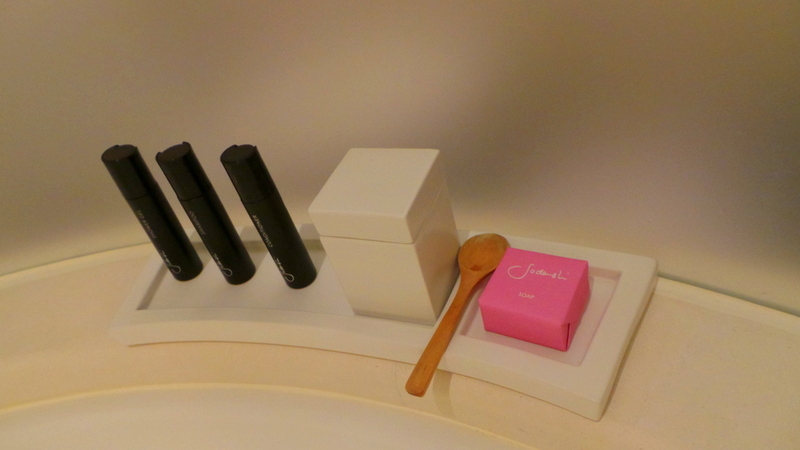 All bathroom amenities are from Sodashi, and I fell in love with their shampoo and conditioner – it left my hair soft (which can’t be said for other hotels no matter what luxe toiletry brand they are). I used the bath tub every night we were there, especially with the generous provision of bath salts. My therapist at the spa suggested I do this to help with the swelling of my injured leg. And I had no problems carrying out her instructions to “relax”. 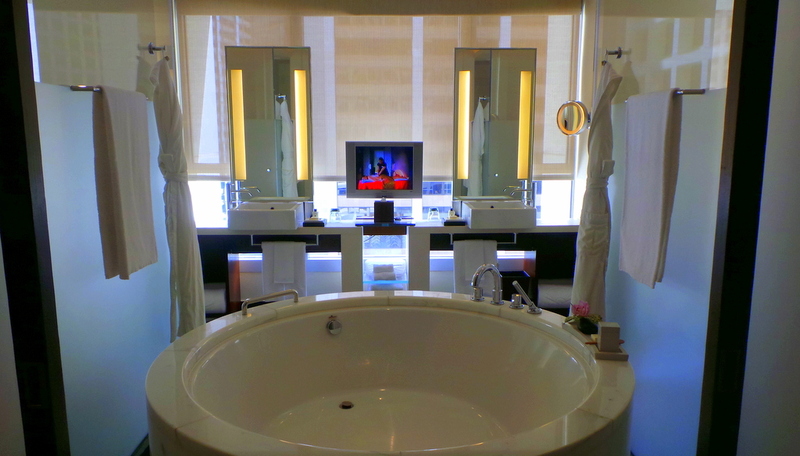 While the bathroom is definitely the highlight of Landmark Mandarin Oriental, the other facilities of the room also deliver . 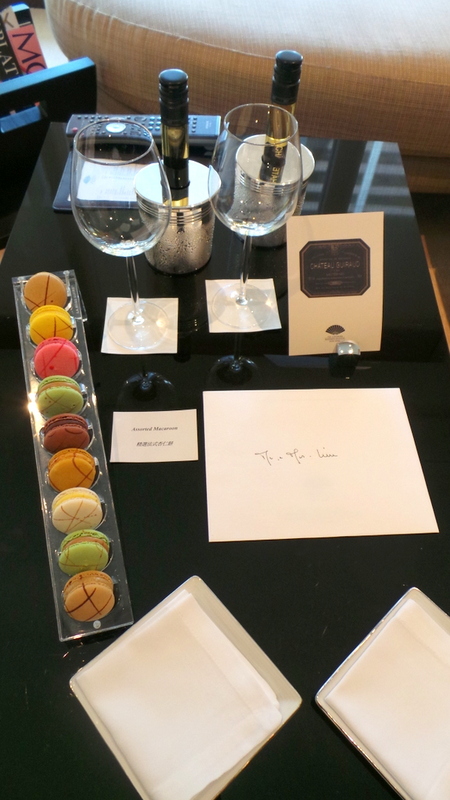 For the first day, it was tube glasses of Moet & Chandon with a tall tray of macarons – the most number of macarons I’ve seen in a welcome amenity. 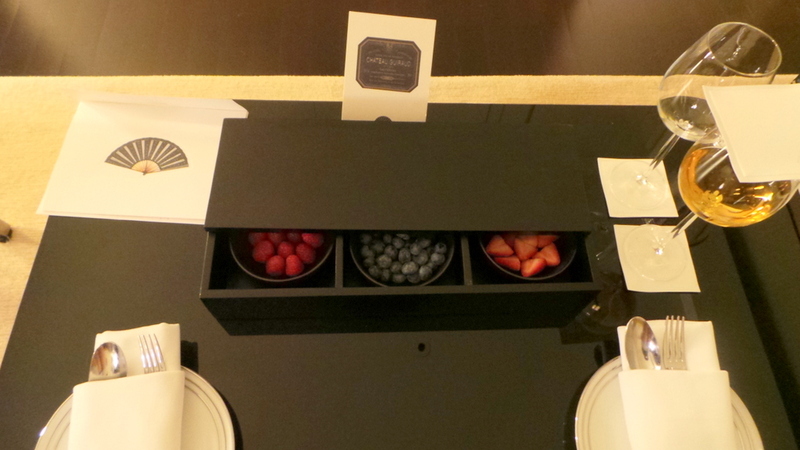 And on the second day, an assortment of berries. This includes a plug for headphones for TV and DVD – perfect if your partner sleeps earlier and you still want to watch TV or movies from the big screen. 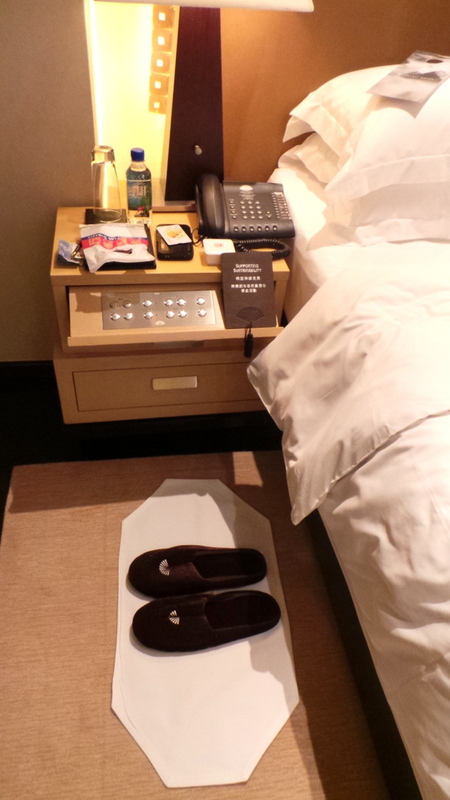 Their turn down service consisted of plush bedroom slippers by the bedside floor. The slippers were thick and ones where your feet can actually slip in and out of easily. I’m sure you’ve all had your fair share of frustration with paper-thin bedroom slippers that seems to require the dexterity of putting on latex slippers around your feet. Apart from the slippers, all window blinds and curtains are drawn shut as well. 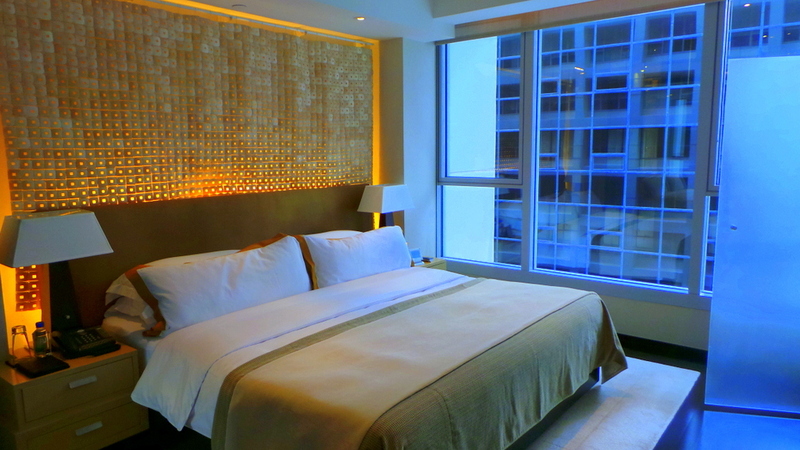 Otherwise with the rooms being almost glassbox like, you can easily be seen at night. My only disappointment in the room amenity is the meager 2 small sized bottles of water per day (1 per person). I suppose it’s marvelous that they provided water at all, but most hotels of the same calibre would provide at least 2 per person each day. Amber Restaurant is 1 of 2 restaurants in the hotel. Amber serves formal dining throughout the day. 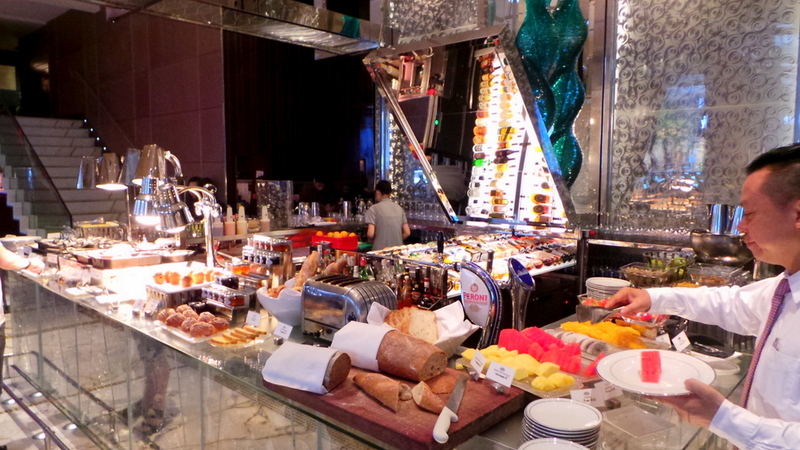 We had a full Chinese Breakfast set at Amber one morning. 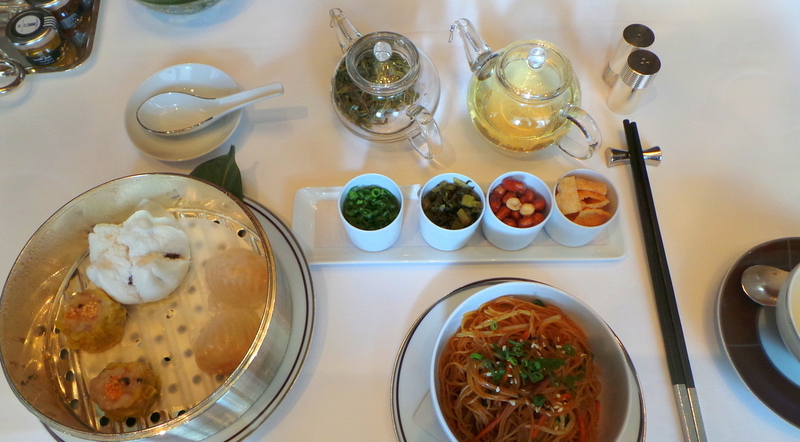 And despite Amber being a French restaurant, the Chinese Breakfast set was extremely good. Dimsum (dumplings and a Barbeque pork bun), Congee and Vermicelli noodles. Green tea. The classic Chinese breakfast set! The other restaurant, MO Bar is at the ground floor of the hotel, also serving meals from breakfast to dinner. If there is anything else that sparkled more brightly than the bathrooms of the Landmark Mandarin Oriental HK, it would be the warm service from every staff that we encountered. Actually, scrap that. It’s not just who we encountered. I appreciate great customer service so I also observe how staff behave towards other guests. The staff were all warm and engaging regardless of who the guest was. Everyone- from the restaurants, to the lobby, to the spa – addresses you personally by name and always had a polite greeting whenever you meet them. Amidst all the excellent customer service, it was Mr. John Suen, Driveway Supervisor (this is his official title from his business card) that stood out the most for me. During the day, he always asked us about our plans for the day ahead and contributed ideas regarding transport and the like to help us (we didn’t ask for help, he initiated the assistance). And whenever he’d see us about to go out for the day, he would say to us, like an admonishing but caring father, “Don’t leave yet, I will grab you some bottles of water as it can get very hot and muggy outside, you will be dehydrated!” And off he would rush to the MO Bar and come back with a bottle for us each. He did this even on the day we checked out. It is warm service like this that really creates a lingering impression for me. Mostly adults and couples. We did see a family too but it was only once. A mix of business and leisure travellers. I do try to keep my tone objective throughout the review, but it’s undeniable – I am quite smitten by the Landmark Mandarin Oriental. It has all the elements of the perfect luxury hotel that I look for – subtle taste, quiet, puts a great premium on spa and wellness, has one of the most gorgeous hotel bathrooms, and amazing customer service. 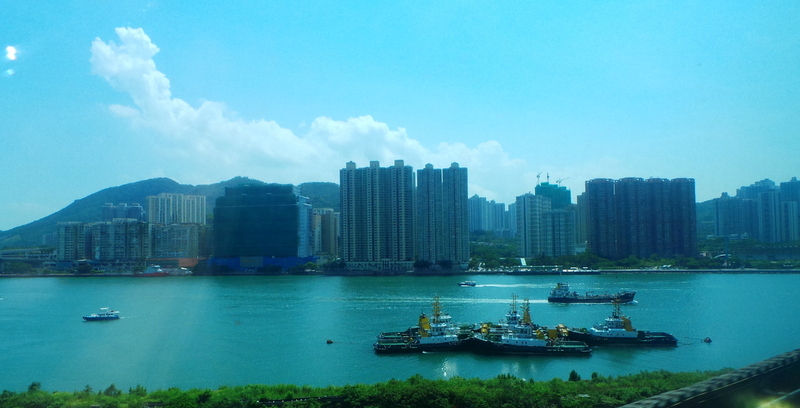 It may not have that one highly-coveted factor that most 5-star hotels in Hong Kong have, which is the harbour view. But what it lacks in, it makes up for it in double-fold in all other aspects. I will have no hesitation to return and stay at the Landmark M.O again and will absolutely recommend it to family and friends. The Landmark Mandarin Oriental has an ongoing Infinity Experience offer*, where if you book an L600 Executive or L900 Landmark Suite, you get a HKD 1,500 Landmark Oriental dailye credit (HKD 1,000 for the L600 Executive), which can be used towards dining or the spa, AND also a HKD 1,500 Landmark Atrium (the mall) shopping voucher (HKD 1,000 for the L600 Executive ) which you can use towards participating shops at the Landmark Mall – an endless list of brands ranging from Alexander McQueen to D&G, & Vivienne Tam. It does sound like an ultimate staycation or weekend stay for me! But now I’m quite curious, what are the factors that make you fall in love with a hotel stay? Very nice and pleasant to read review! If you like Mandarin Oriental brand, I really recommend to try the MO Shanghai which is absolutely incredible ; probably my best urban hotel worldwide. Congratulations on the nice nod from the Luxe Insider! Way to go!!! The hotel looks lovely. Nothing beats great service, though, right? 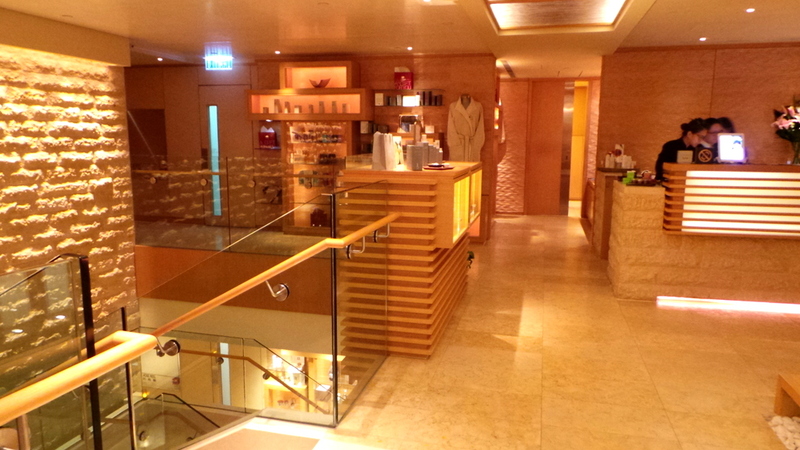 We recently experienced some really great service on a cruise that we took. While the cruise itself was very good, it was the great service that really sticks out in my mind as I remember the trip. Thank you Greg, its really such an honour! Exactly, about service. Mediocre product will be forgotten if the service is great, and most often no matter how superior or luxurious a product is if the service is mediocre at best, I won’t remember the finer things. It’s service that we really remember on trips! It’s great to have superior service on a cruise, as I imagine you will be with them for more than 2 days in a row ! Gahhh… This post made me soooo jealous. In desperate need of a holiday. Great post Jean. Great comprehensive review, that hotel does sound like an oasis in busy Central. Noted for the future! Oh Adrienne I’m jealous of my past self being in that hotel! It’s truly one of the best I’ve stayed at.